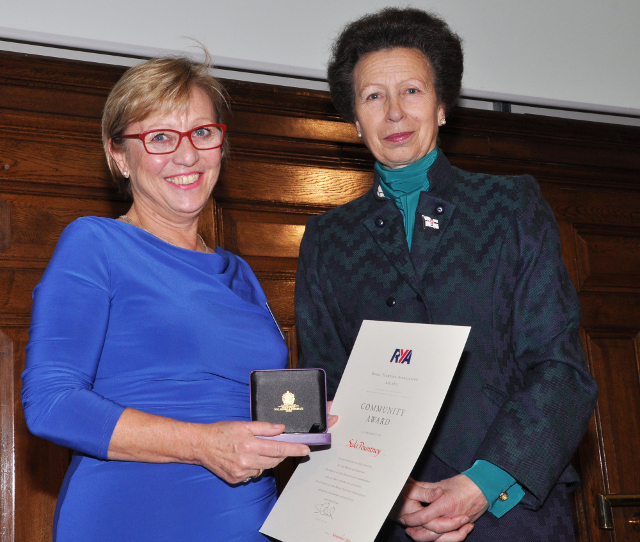 A sailor who spends all her spare time in Seaview had her outstanding volunteer endeavours recognised by Her Royal Highness, The Princess Royal at the annual RYA Volunteer Awards in London last Friday (21 November). Seaview Yacht Club’s Suki Pountney was amongst some 47 winners from across the UK honoured for their exceptional generosity and dedication to boating at the awards ceremony and exclusive luncheon held at One Great George Street, Westminster. Suki received a Lifetime Commitment Award and was presented with a commemorative medallion and certificate by HRH, President of the RYA. The Award was in recognition of her efforts in nurturing the club’s young sailors and raising significant funding to help this promotion, as well as for other causes for young sailors. 1 Comment on "Lifetime Commitment Award for Seaview’s Suki"
Exclusive luncheon ? – I am sure it was if Seaview YC had anything to do with it.